Slinger WI offers you the best of what Wisconsin has to offer—a strong sense of community with a small-town feel, conveniently located within commuting distance of everything the great city of Milwaukee has to offer. 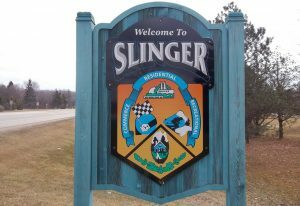 In the wonderful village of Slinger, you’ll find a handful of great local parks, as well as an aquatic facility, centered around a 1.14-acre swimming pond—great for family fun! Slinger is also home to the Slinger Super Speedway, the world’s fastest quarter mile paved oval. With plenty of beautiful homes available, Slinger is the perfect place to live for commuting professionals and families. Click on the link below to view the available homes in Slinger, and if you like what you see, contact our knowledgeable and professional NextHome Lake Country Slinger real estate agents today!